A New Year means a new beginning. And for us that means eating healthier. This takes a lot more planning and meal prep but worth it in the end. Plus we need to find a way to keep the variety and tastiness in what we are eating. So far so good. 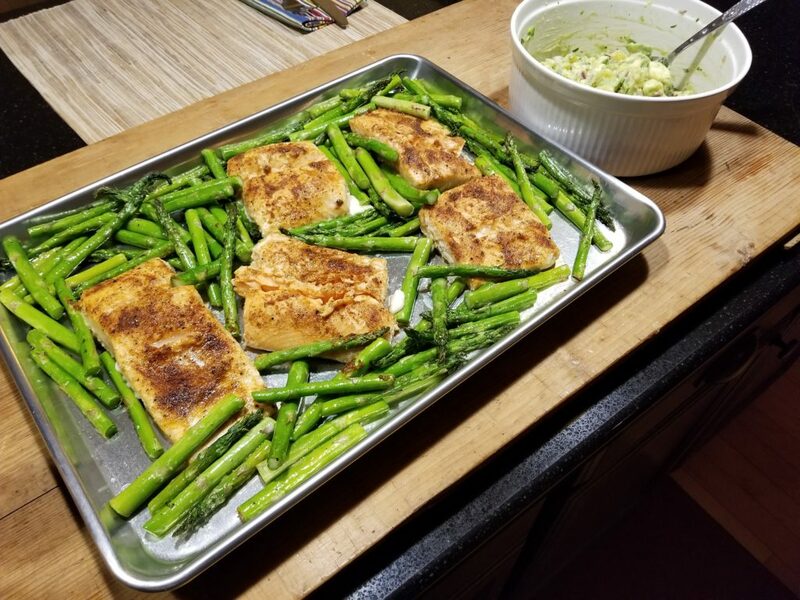 Tonight’s supper was sheet pan salmon with avocado salsa and a side of asparagus. I got this recipe from the fit2fat2fit guy. I read his ebook over the holidays and it had some good information along with some good recipes. 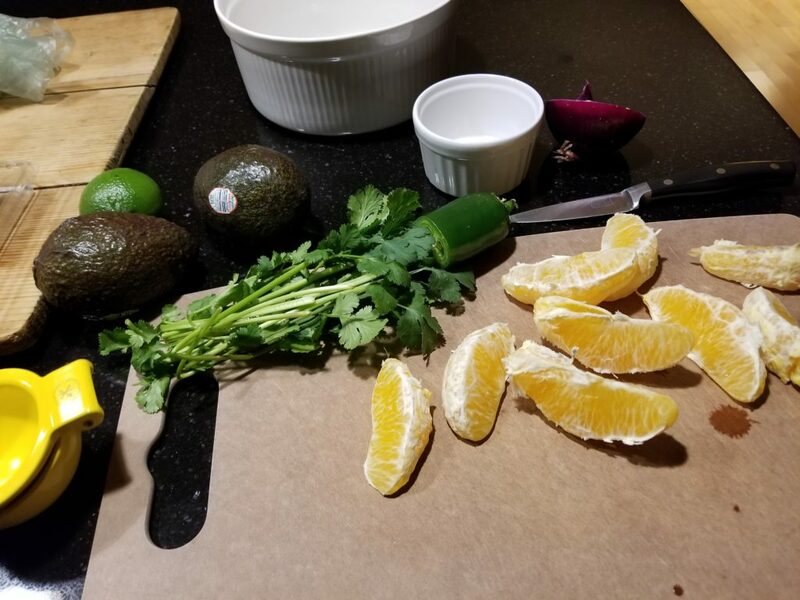 The salsa had avocado, diced oranges,red onion, jalapeno, cilantro and lime juice. 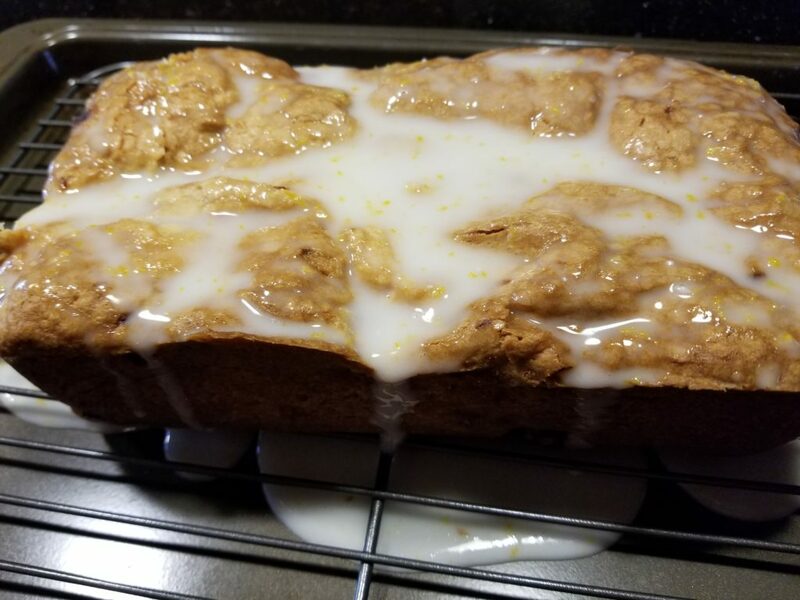 First time using oranges and it was tasty! Used this to serve over the salmon. Simple to mix up and chill while you are preparing your salmon! 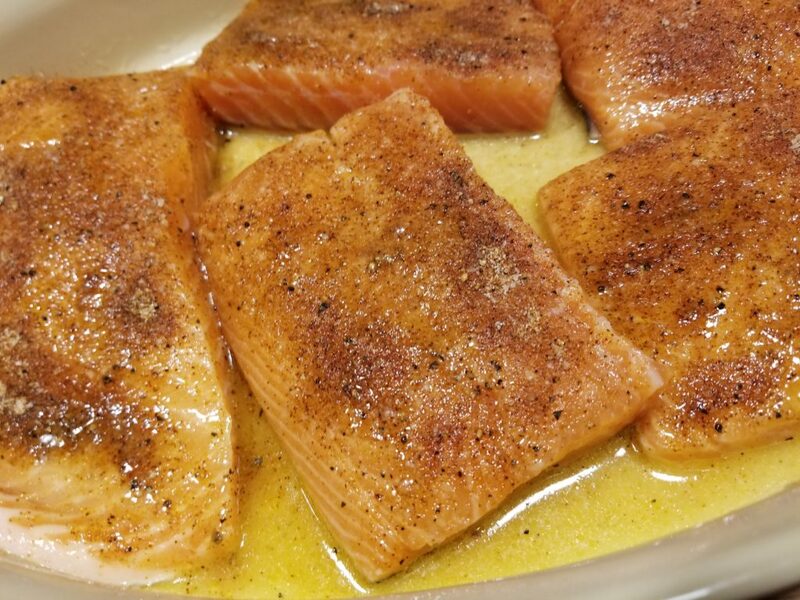 For the salmon – Marinate this in olive oil and a couple tablespoons of fresh squeezed orange juice. Sprinkle the spice mixture on the fillets and let sit for about 30 minutes. I cooked this all on a sheet pan for easy cleanup! Preheat the oven to 425 degrees. Put the sheet pan in the oven while it is preheating. Remove the hot pan from the oven and place salmon and asparagus on it. You will get a nice sizzle so be careful. Bake for about 10 minutes or until the fish flakes easily. It took 12 minutes for me. Combine all ingredients in a small bowl and mix well. Cover and chill until ready to serve. In a baking dish combine olive oil and orange juice. Lay salmon in dish and turn to coat. In a small bowl combine the spices. Sprinkle all over the salmon and let marinate for 30 minutes. Lightly coat a sheet pan with cooking spray and place in oven, Preheat oven to 425 degrees. Remove pan and carefully place salmon fillets on it. 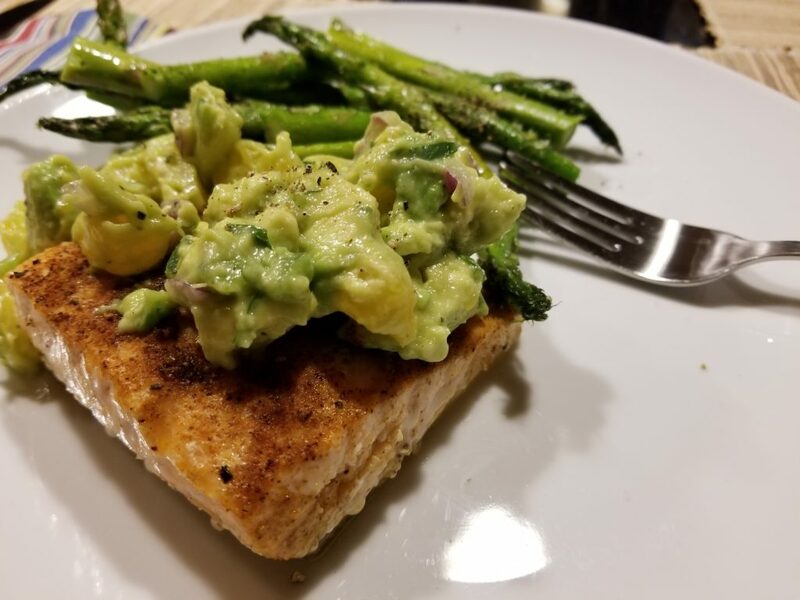 Toss asparagus around salmon and return to oven. Bake 10 – 15 minutes, until fish flakes easily. Start checking at 10 minutes. 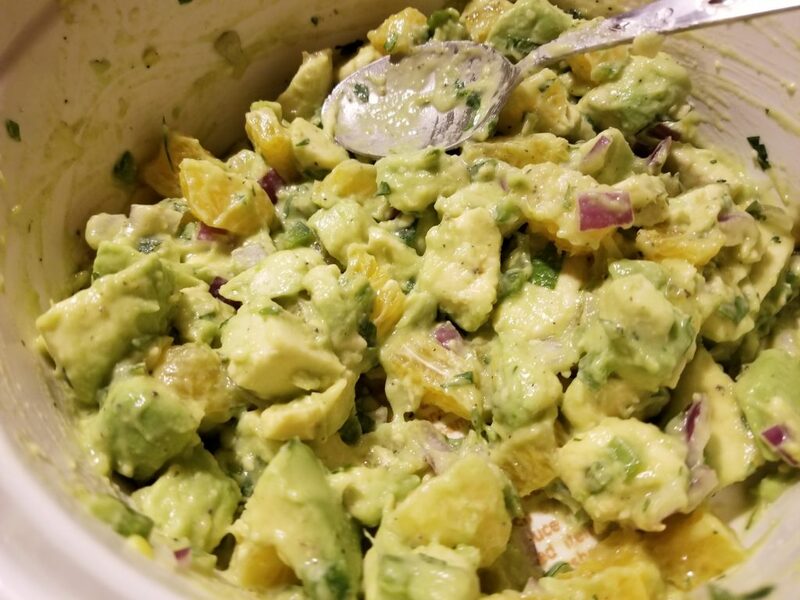 Serve with chilled avocado salsa. Kris and I had our usual New Years Day brunch. This year was really low key, no set times, just show up and grab some food and watch a little football. Black-eyed peas were once again the star of the show. If you are not sure why we always have them on New Years Day well they are supposed to bring you luck and good fortune in the new year!! Not sure if it works, but why chance it?? 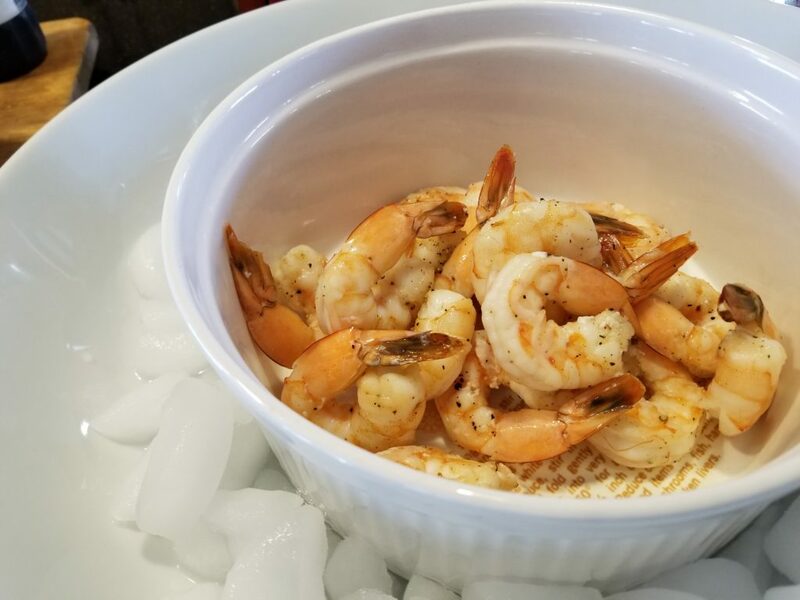 We had a few other goodies as well – roasted shrimp with cocktail sauce. 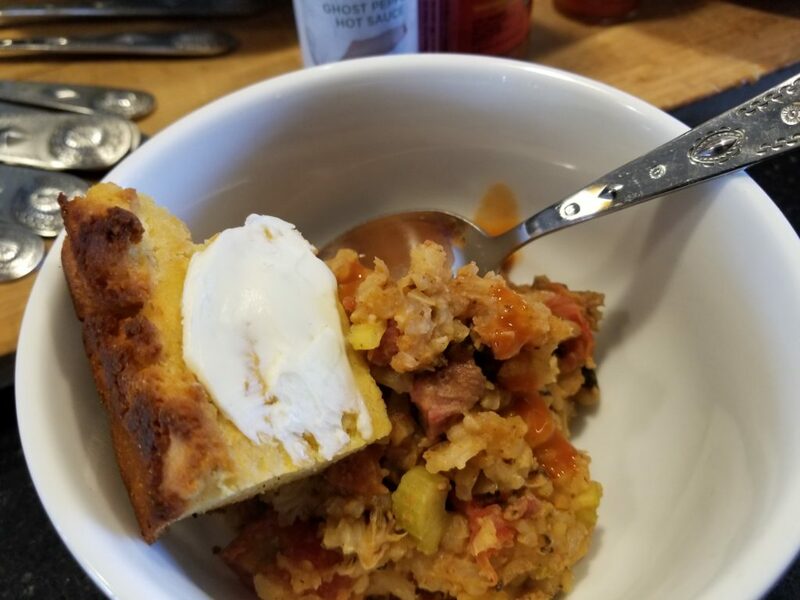 Homemade corn bread – I used Masa (instead of cornmeal) for this and it turned out excellent!! Add a little butter and this was a perfect compliment to the peas. 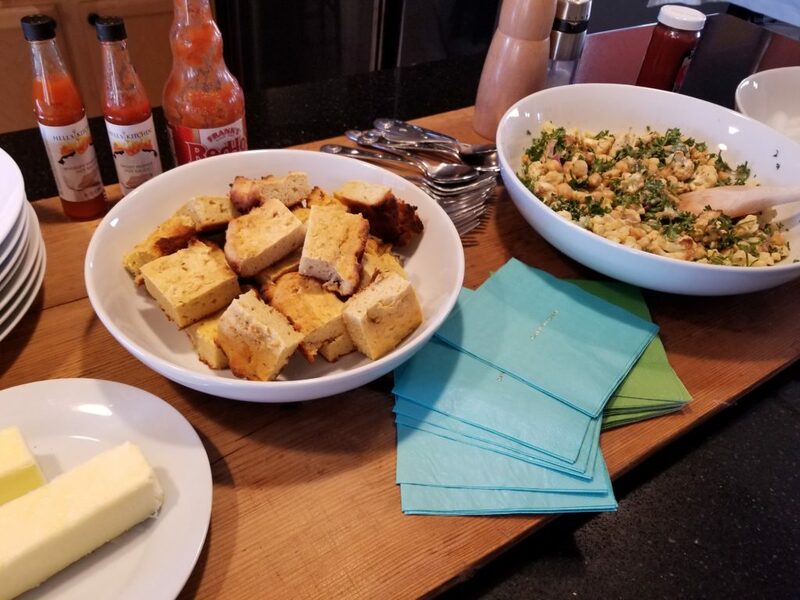 Kris also made a cauliflower, chick pea salad that was awesome. Fresh parsley and a Tahini dressing helped cool off the palate after some peas loaded with hot sauce. 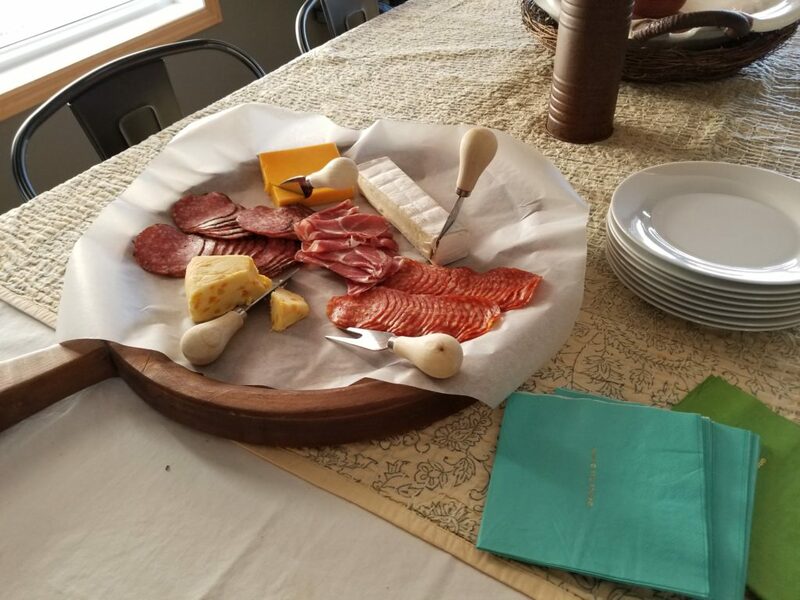 And the day would not be complete without a cheese and meat tray! Happy New Year to everyone!!! Time to get cooking!! 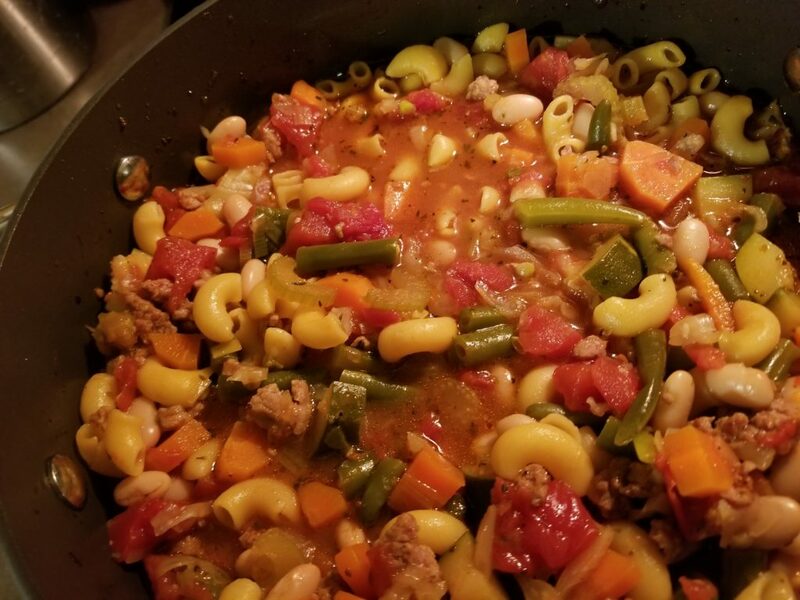 Soup season is officially here in Minnesota. 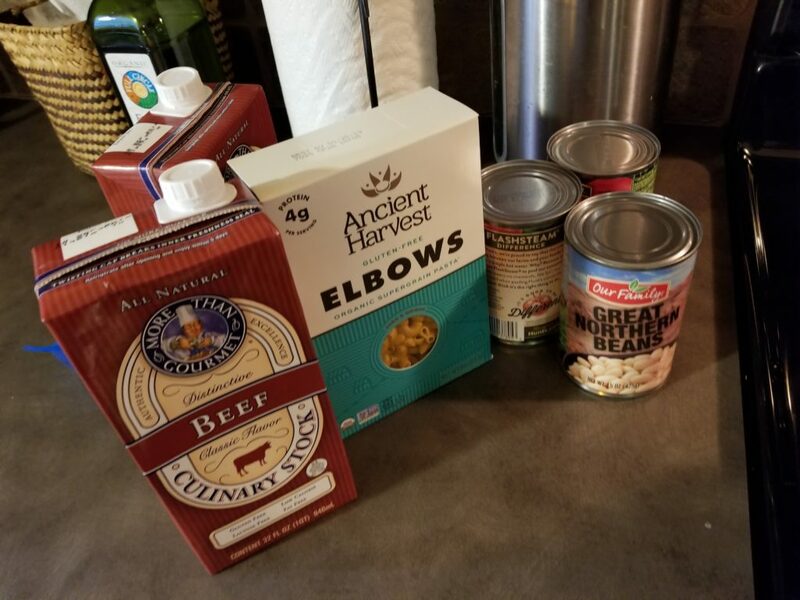 Weather is turning cold so nothing warms the bones like a good bowl of soup! 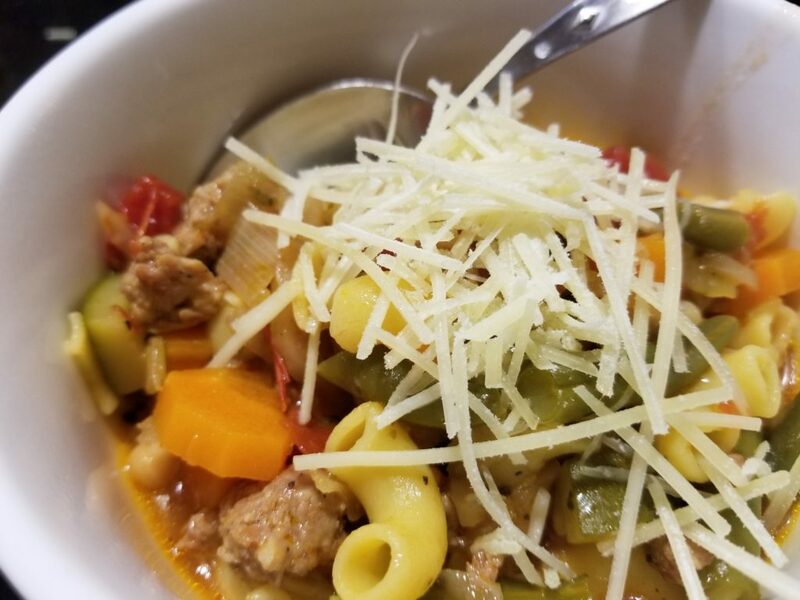 This is my first go at Minestrone and it turned out quite tasty. 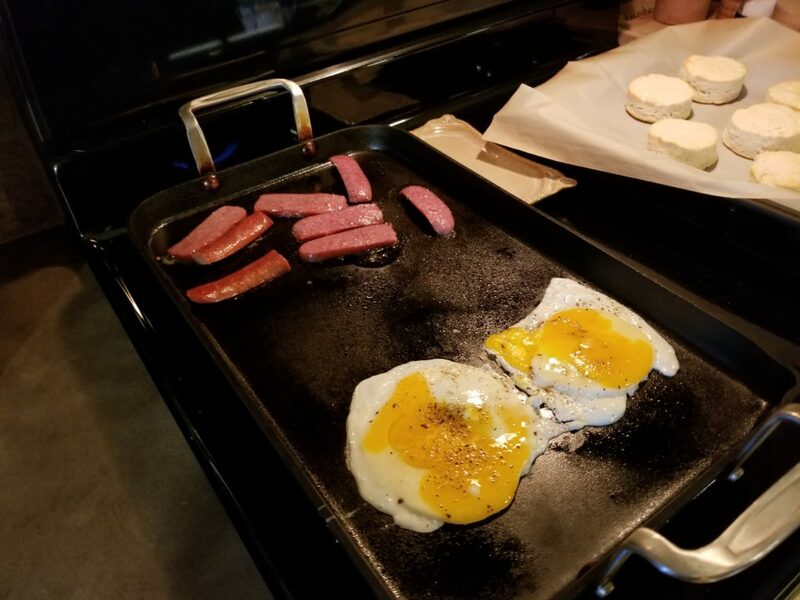 I use breakfast sausage as that is what Kris and I prefer. 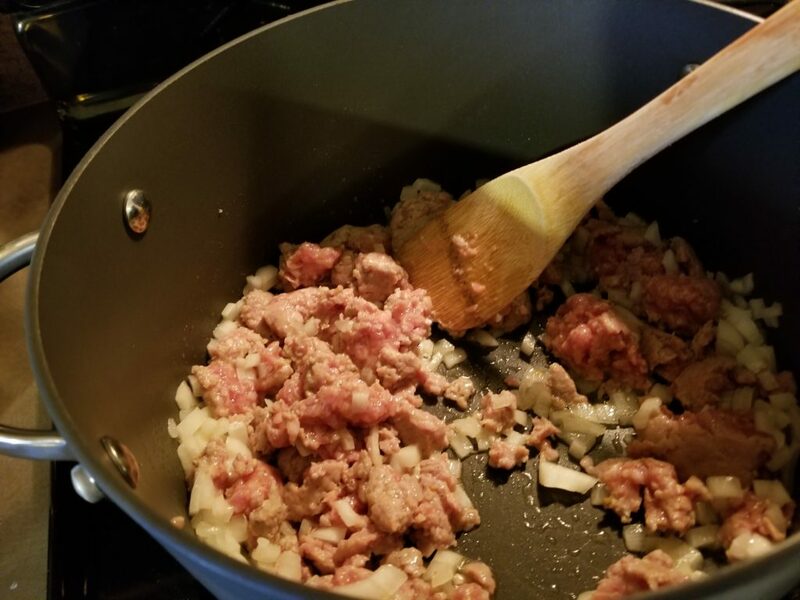 You can use Italian sausage as well. Gather up your pantry ingredients and prepare to cook! 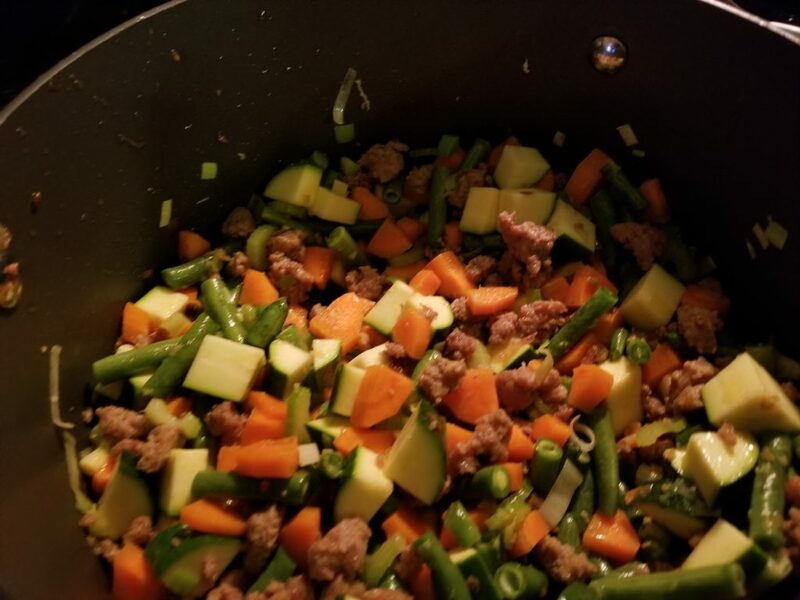 You will also need to chop up some veggies for this soup. There are lots of recipes out there but this one will be my go to. First thing is to cook the sausage and onion in a soup pot. Cook until sausage is no longer pink, drain. 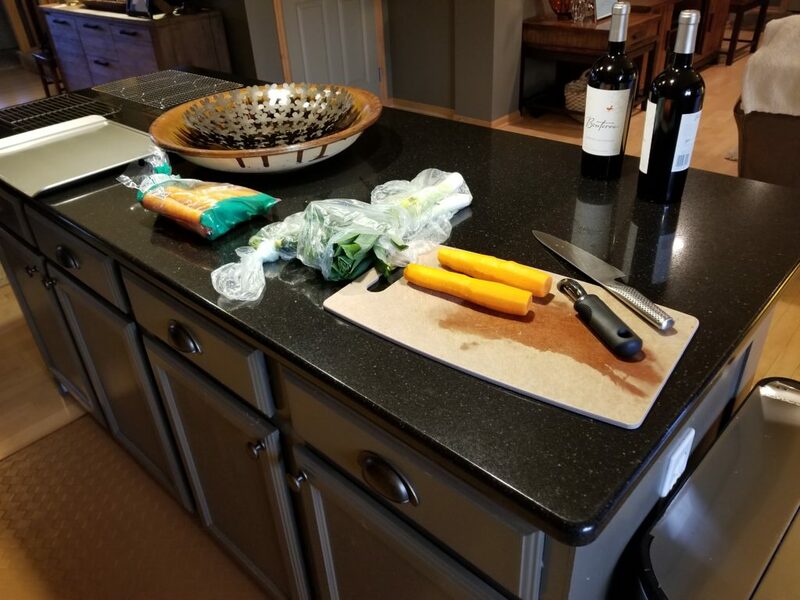 Add carrots, celery, leek and garlic. Cook for about 3 minutes. Now add zucchini and green beans. Cook for another 2 minutes. Stir in broth, tomatoes, cabbage basil, oregano and pepper. Bring to boil. Reduce heat, cover and simmer for 45 minutes. Return to boil and add in pasta, garbanzo beans and parsley. Cook 6-9 minutes or until pasta is tender. Now serve in a large bowl with some freshly grated parmesan cheese. Cheers!! Stir in broth, tomatoes, cabbage, basil, oregano and pepper. Bring to a boil. Reduce heat; cover and simmer for 45 minutes. Return to a boil. Stir in the garbanzo beans, pasta and parsley. Cook for 6-9 minutes or until pasta is tender. Serve with Parmesan cheese. Yield: 11 servings (about 3 quarts). Kris and I were watching The Pioneer Woman on Food Network and she was making a care package for her daughter in college. What a great idea! So we decided to do the same for our 2 nieces. One at Colorado State and the other at Rutgers. 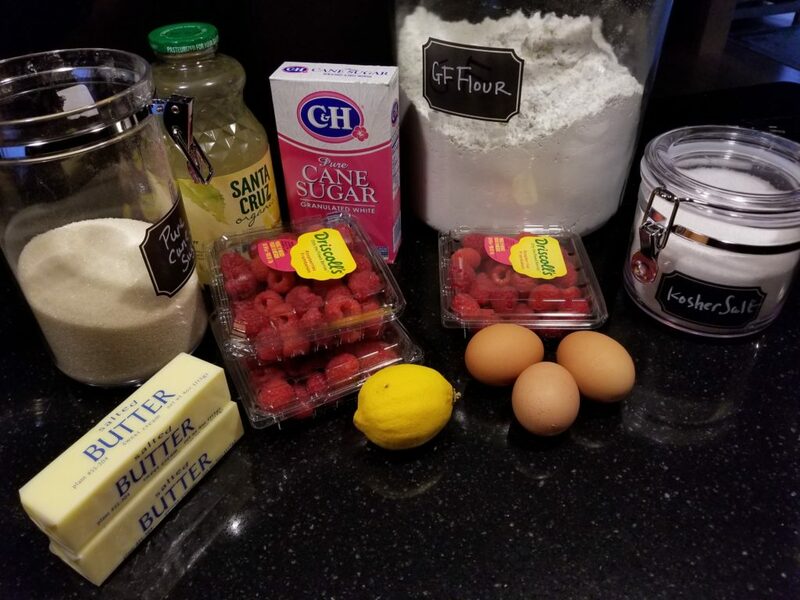 In the episode Ree Drummond made a variety of things to add to the care package, including this Lemon and Raspberry pound cake. I also made one for me and Kristen and it is soooo gooood! Of course I used gluten free flour to make these and the cup4cup brand is an excellent substitute for regular flour. You can not even tell the difference. Gather up all the goodies and get started. First step is to make the batter. 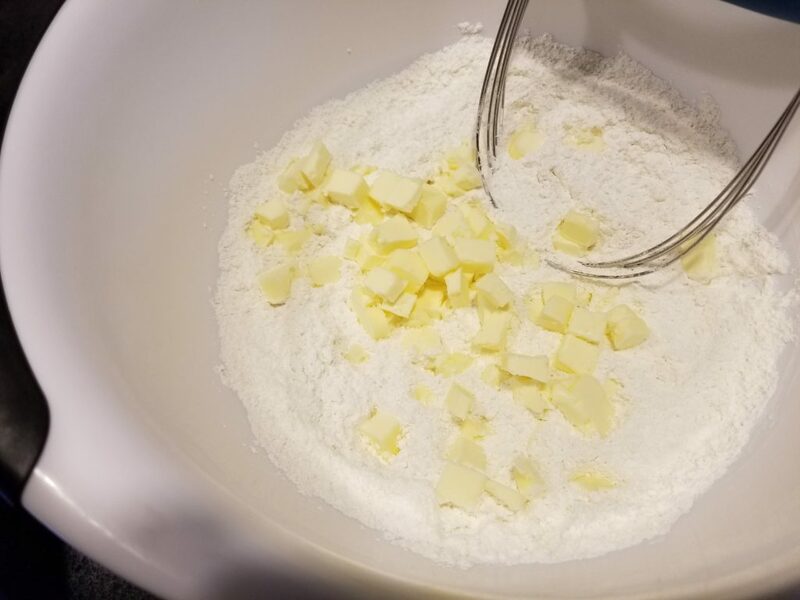 In the bowl of an electric mixer fitted with a paddle attachment, cream together the granulated sugar and butter. Add the eggs 1 at a time, mixing after each addition. Turn the mixer to low and gradually add all but 2 tablespoons of the flour (reserve the 2 tablespoons for the raspberries). Add the lemonade and salt and mix until combined. Add the lemon zest and mix. Scrape the bowl. Toss the remaining 2 tablespoons flour with the raspberries in the bowl; this will stop them from sinking. Fold the raspberries into the batter with a spatula. Butter and flour a 9-by-5-inch loaf pan. Pour the batter into the loaf pan and even out the surface. Bake until a toothpick inserted in the center does not come out totally clean but isn’t wet with batter either, 1 hour and 15 minutes to 1 hour and 30 minutes. 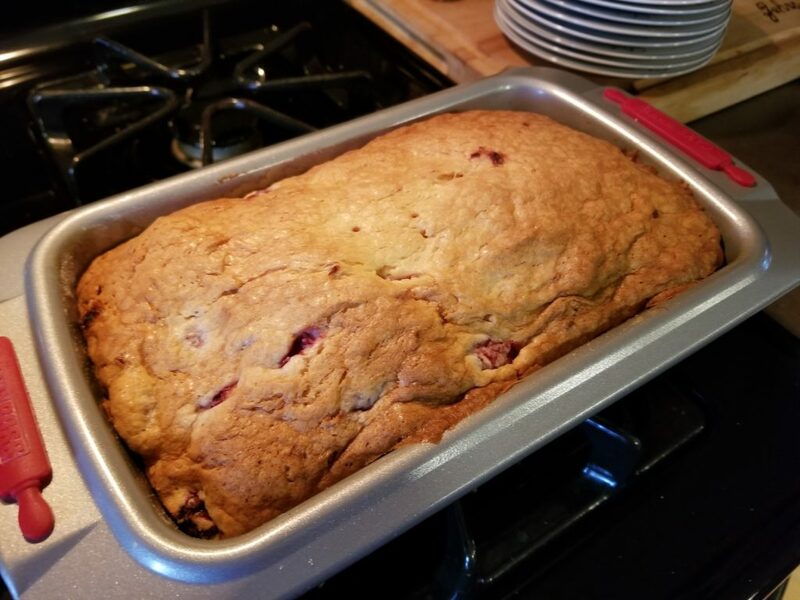 Let the cake sit in the pan for 30 minutes, then carefully turn it out onto a cooling rack set over a baking sheet to cool. Once cool make the glaze on pour over top. Slice up and enjoy. Cheers! 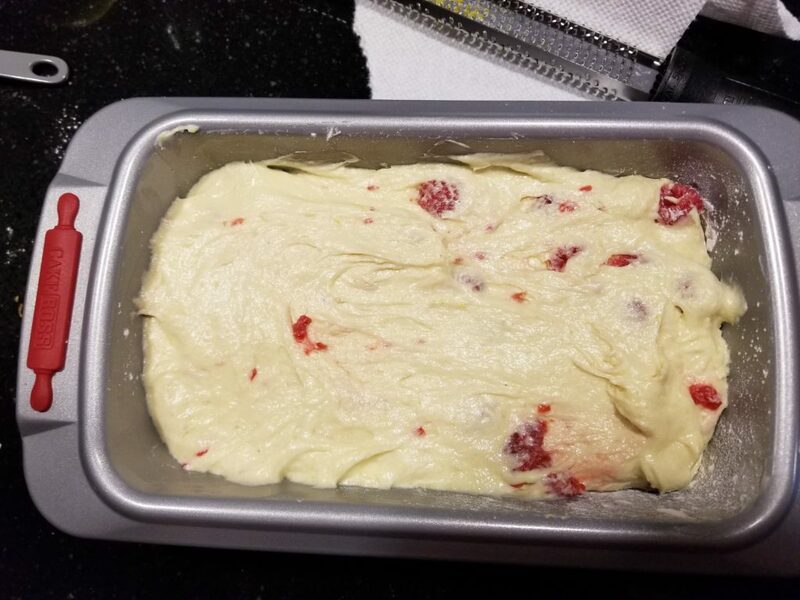 For the cake: Preheat the oven to 325 degrees F. Put the raspberries in a bowl and set aside. 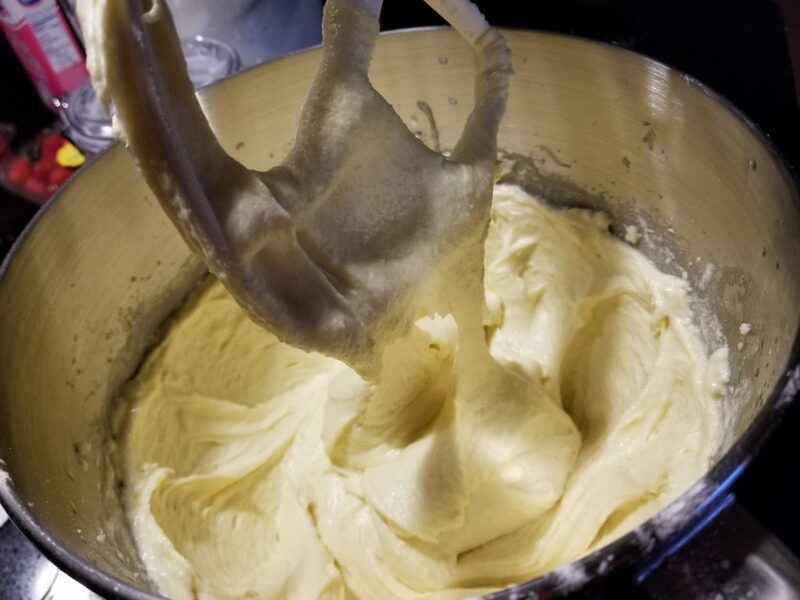 In the bowl of an electric mixer fitted with a paddle attachment, cream together the granulated sugar and butter. Add the eggs 1 at a time, mixing after each addition. 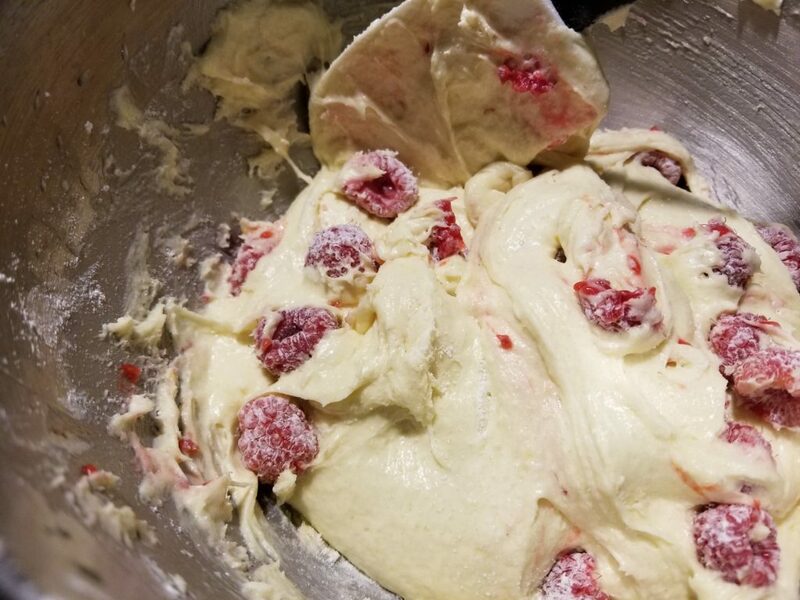 Turn the mixer to low and gradually add all but 2 tablespoons of the flour (reserve the 2 tablespoons for the raspberries). Add the lemonade and salt and mix until combined. Add the lemon zest and mix. Scrape the bowl. 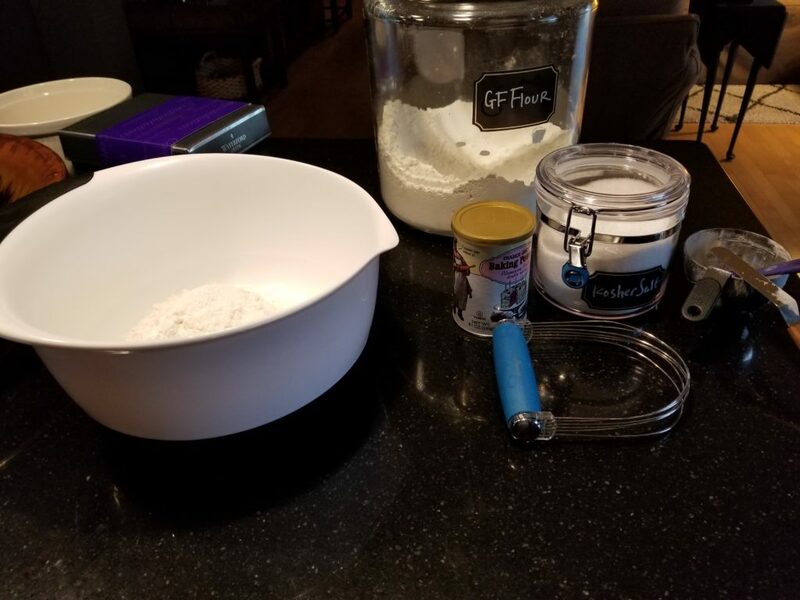 Butter and flour a 9-by-5-inch loaf pan. Pour the batter into the loaf pan and even out the surface. Bake until a toothpick inserted in the center does not come out totally clean but isn’t wet with batter either, 1 hour and 15 minutes to 1 hour and 30 minutes. Let the cake sit in the pan for 30 minutes, then carefully turn it out onto a cooling rack set over a baking sheet to cool. Combine the powdered sugar, lemon zest and juice, salt and 2 tablespoons water in a bowl. Gently whisk until thick but pourable, adding a little more water if needed. Drizzle the glaze over the cake and let set. 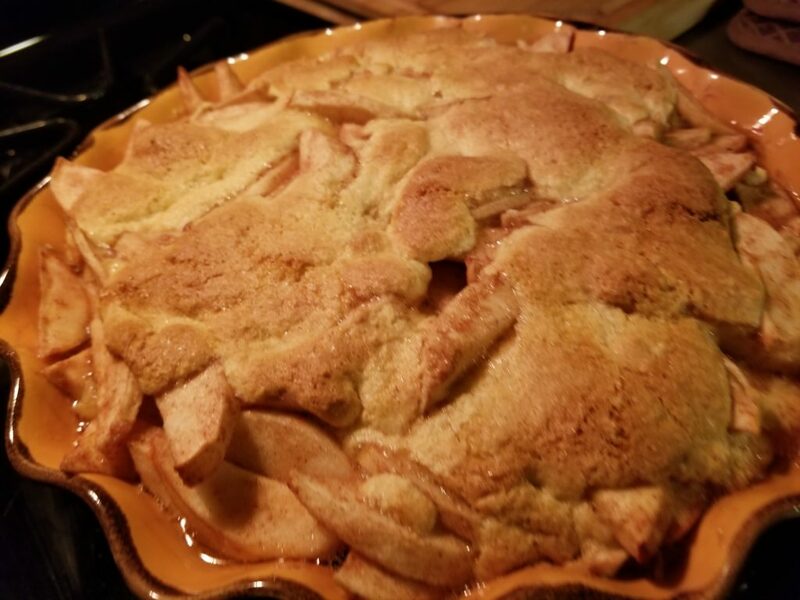 A trip to the apple orchard last weekend resulted in this beauty – Apple Cobbler! Kris and I decided to hit a new apple orchard this year. 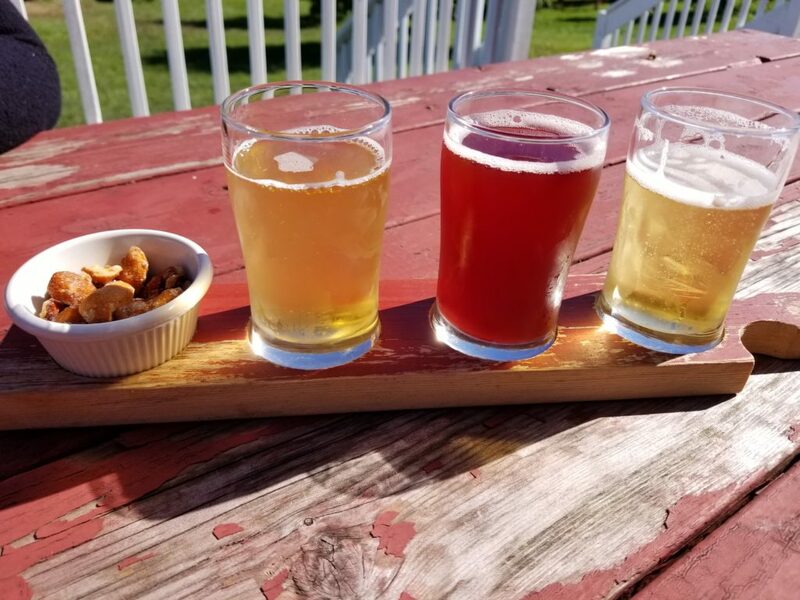 A recommendation of a friend led us to the Deer Lake Orchard near Buffalo. Great choice! Not too busy and they have a Cider Tap Room!! Not only did we get some great apples, we had some great hard cider as well. After trying a flight, we found a favorite and purchased a couple bottles of the Number 12 Sprkling Dry cider. We highly recommend this one! Now back to the cobbler. This is easy to make and has the taste of fall. I used a pie plate to bake this up. Nothing beats some fresh picked apples. 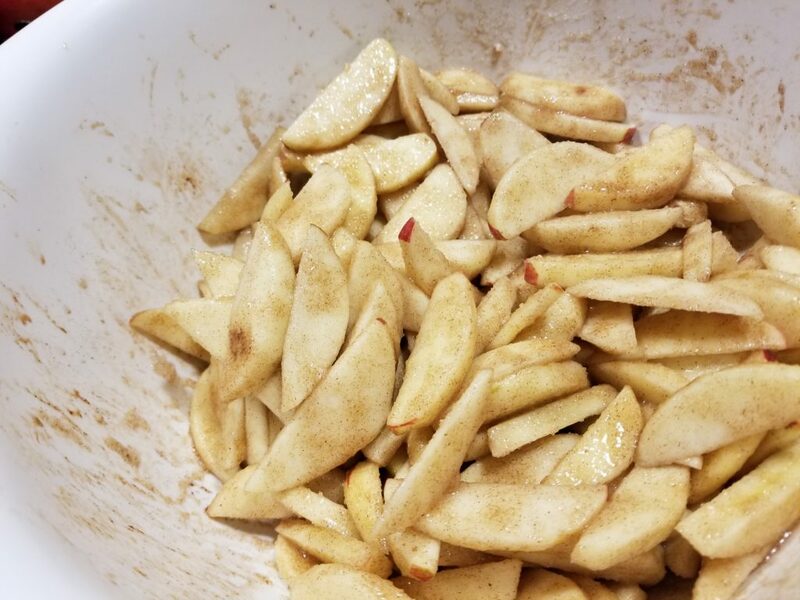 First peel and slice up the apples and toss in a large bowl. Add the filling ingredients and coat well. Pour into the prepared pie plate and set aside will mixing up the topping. Mix the topping up in a small bowl. The dough will be sticky but that is OK as you will be just dropping it on top of the filling. Bake in a preheated 350 degree oven for 35 – 40 minutes. 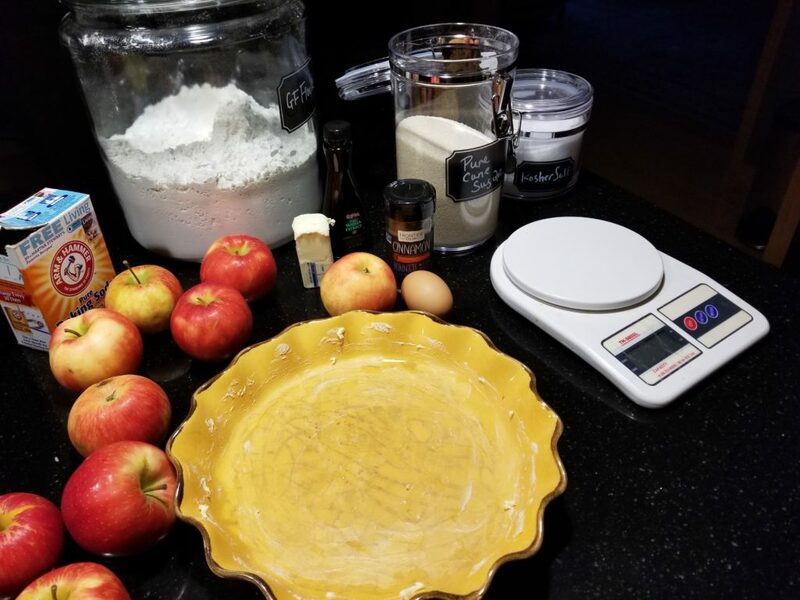 The top will be golden brown and the apples tender. Well it was a cold and rainy morning here so time to make some biscuits! I have not made biscuits in awhile so this was the perfect morning. Cranking up the oven to 450 degrees helps take the chill out of the house. 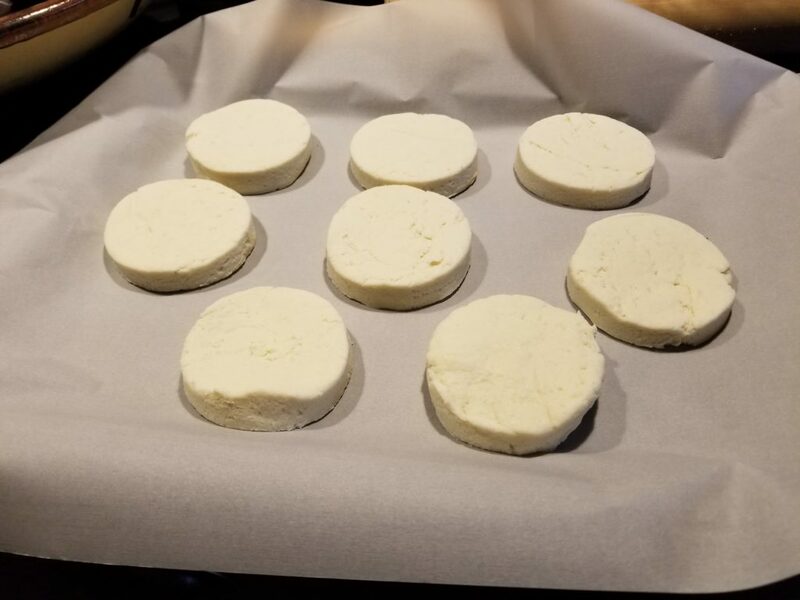 Biscuits are pretty easy to make, just a few ingredients and no rising time as you do not use yeast for these. Gather up the ingredients and get started. Be sure to use cold butter! Cut it into pea size pieces and cut in with a pastry knife. If you do not have one, you can use 2 forks. Continue until you have a grainy mixture and the butter is evenly distributed. Add milk and stir until soft dough forms. If it is too sticky, add 1T of flour at a time. Careful not to add too much or the biscuits will be dry. Roll out dough to 1/2 inch thickness and cut out. Gather scraps and continue until all biscuits are cut out. Place on parchment covered pan and toss in 450 degree oven. Bake for 10-12 minutes and top is golden brown. That is it! 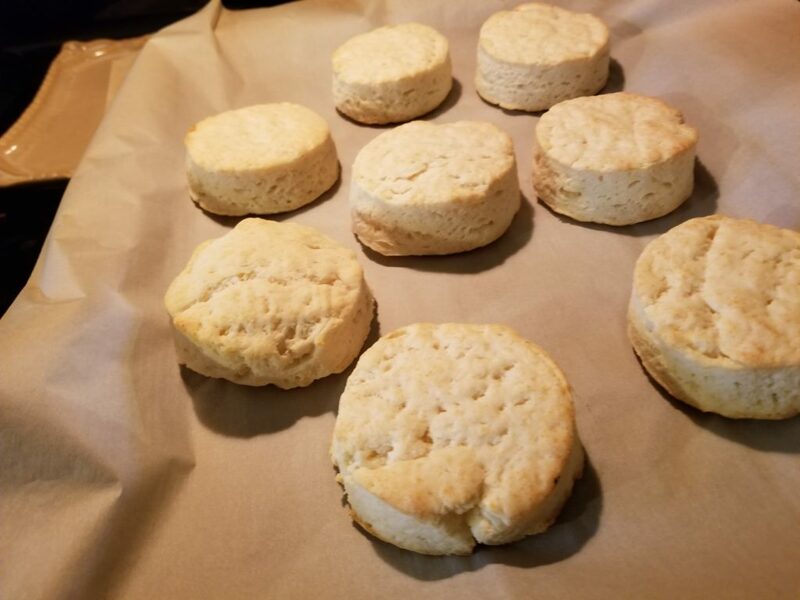 You have some fresh homemade biscuits. 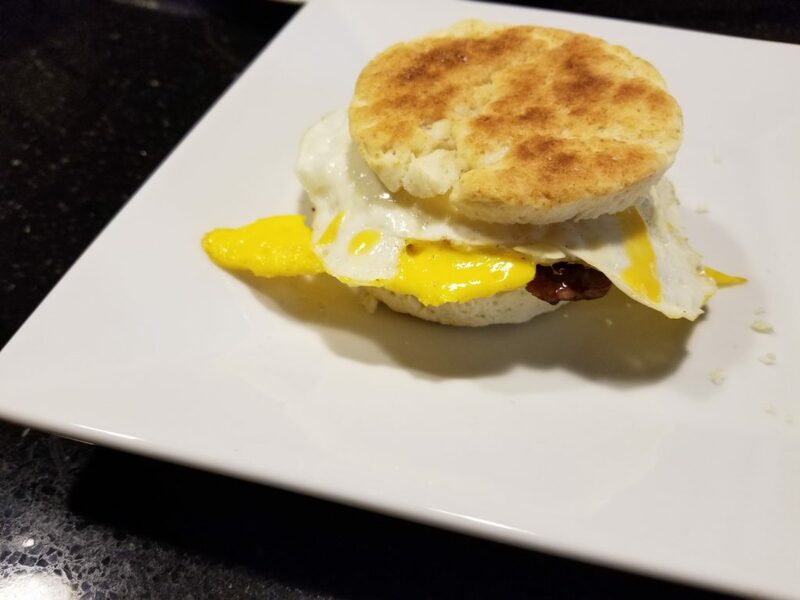 I cooked up some eggs and smoked sausage to make the biscuit sandwich. A great breakfast for a cold and rainy morning. Cheers! In a large bowl, combine flour, baking powder, salt and butter. Using a pastry cutter, cut in butter until a coarse meal develops and butter is evenly distributed. 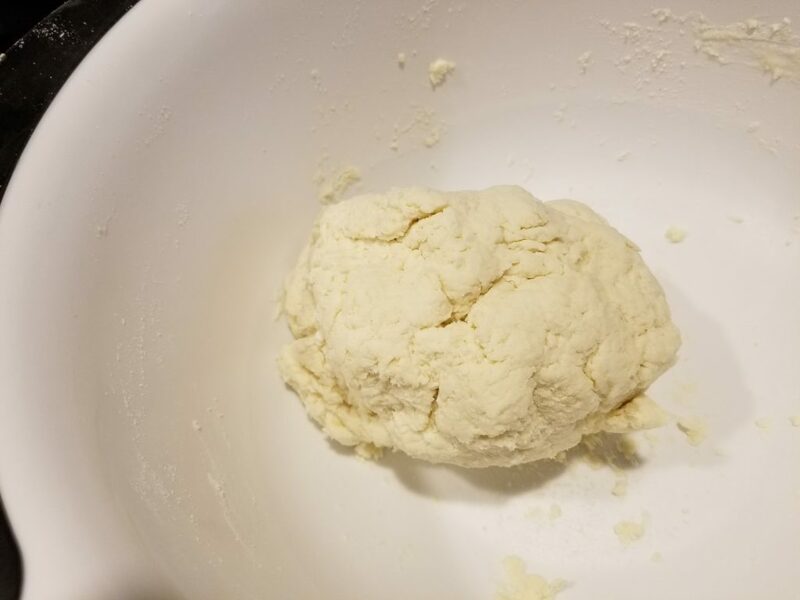 Add milk and stir until a soft dough forms. If the dough is sticky, add more flour 1 tablespoon at a time. 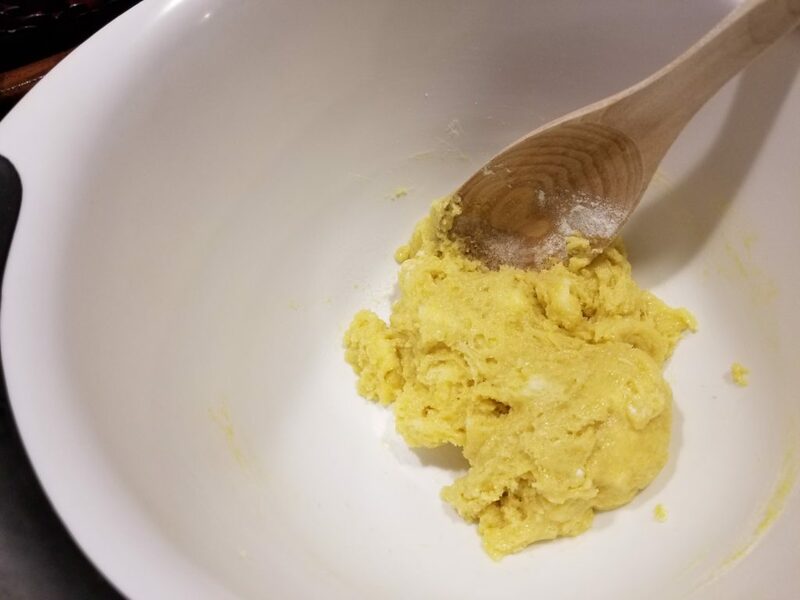 Turn the dough out on to a lightly floured surface and knead for 20 seconds, adding flour if the dough becomes sticky. 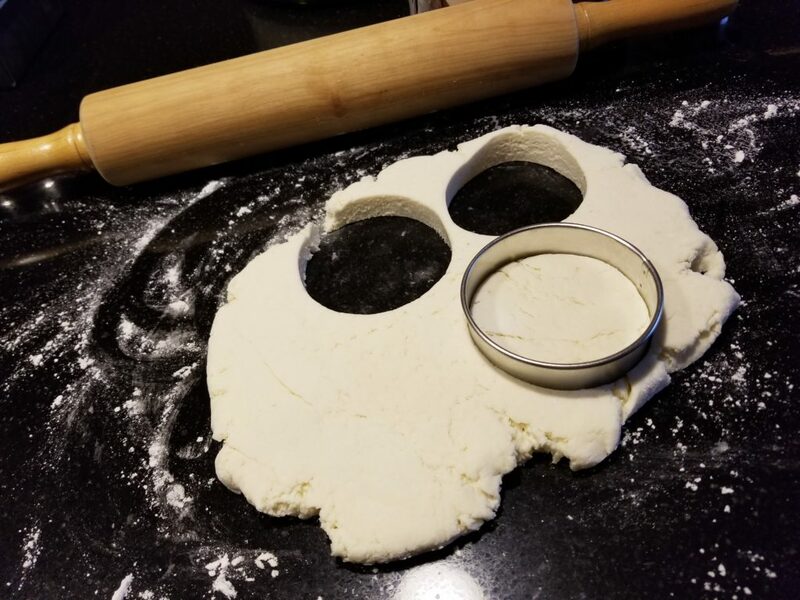 Roll out to 1/2-inch thick and cut out biscuits with a biscuit cutter. Press together uncut dough and continue rolling and cutting biscuits. Bake until lightly golden brown on top and fragrant, about 10 to 12 minutes. Kris does not cook that often, but when she does it is always amazing. 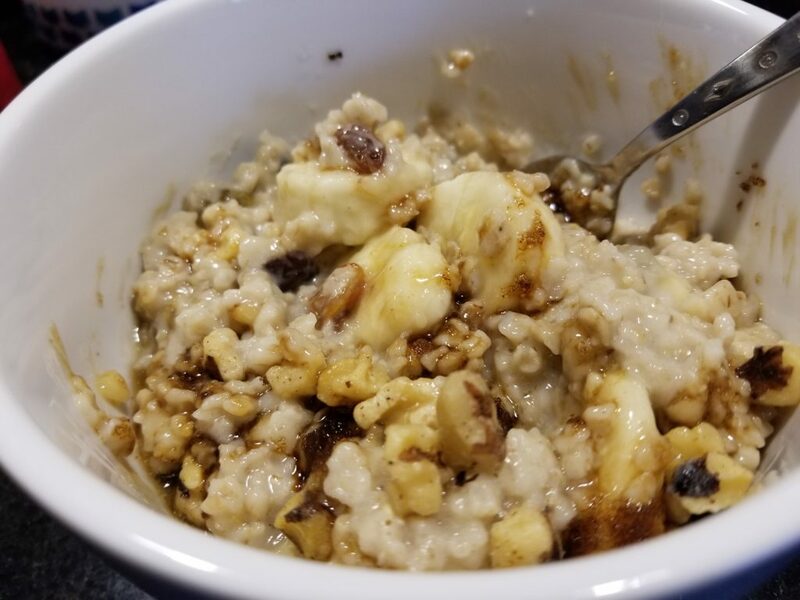 After seeing this oatmeal on ‘Barefoot Contessa’ Kris said she was going to make this. Best oatmeal ever! We will be having this on the menu as fall and winter set in!! Be sure to use quick cooking oatmeal. Instant would be too mushy and regular would take too long to cook. This can be whipped up in 30 minutes or so. Instead of milk we use Ripple ,a plant based alternative, and still get the creamy texture you want. 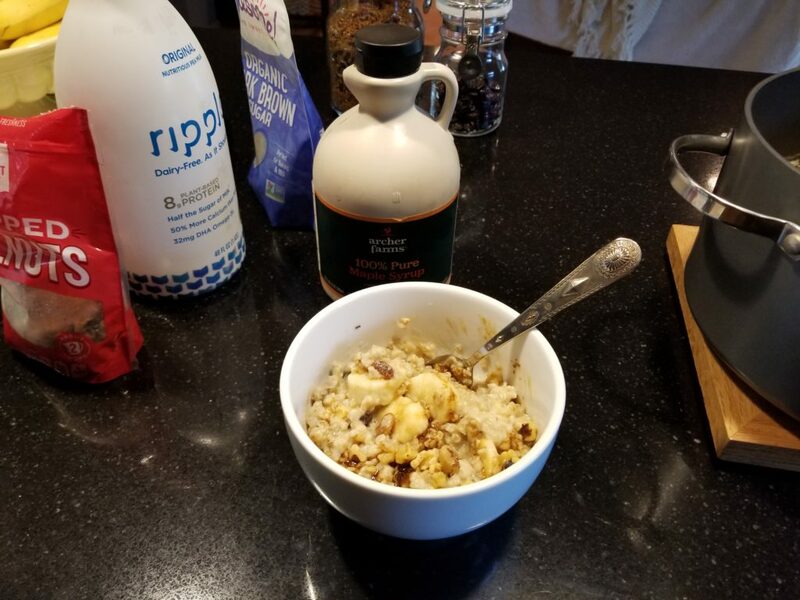 Add in bananas, dried cherries and raisins and you have a seriously hearty breakfast!!! Kris needs to cook more often:) Cheers! Heat milk plus 2 cups of water in a medium saucepan until it starts to simmer. Add oatmeal and salt, bring to a boil. Reduce heat and simmer 4 to 5 minutes, stirring occasionally until thickened. You may also add extra milk to taste. Suggestions for stir-ins: chopped walnuts, slivered almonds, minced dried apricot, chopped apple (dried or fresh) etc. 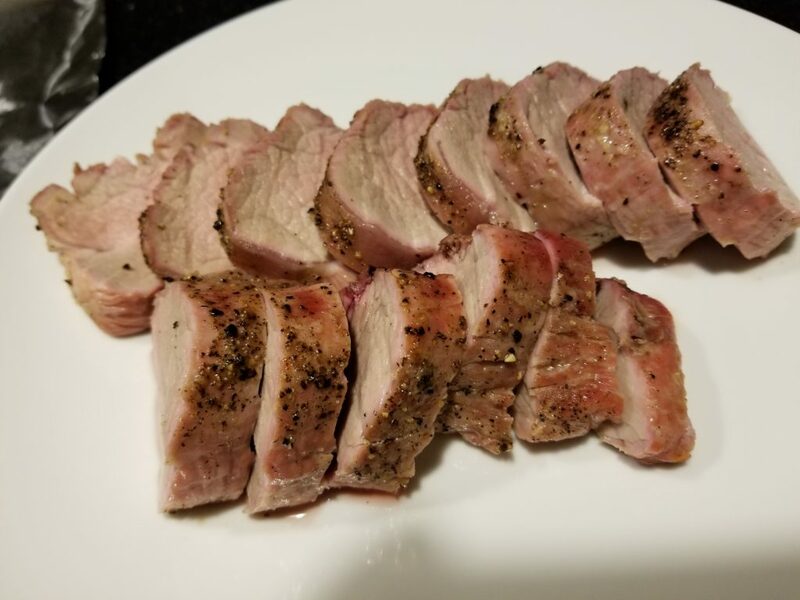 Grilled pork tenderloin is a weekday favorite around here. Fast and easy to grill, only takes 30 minutes. Tonight I decided to serve this with some mango salsa. 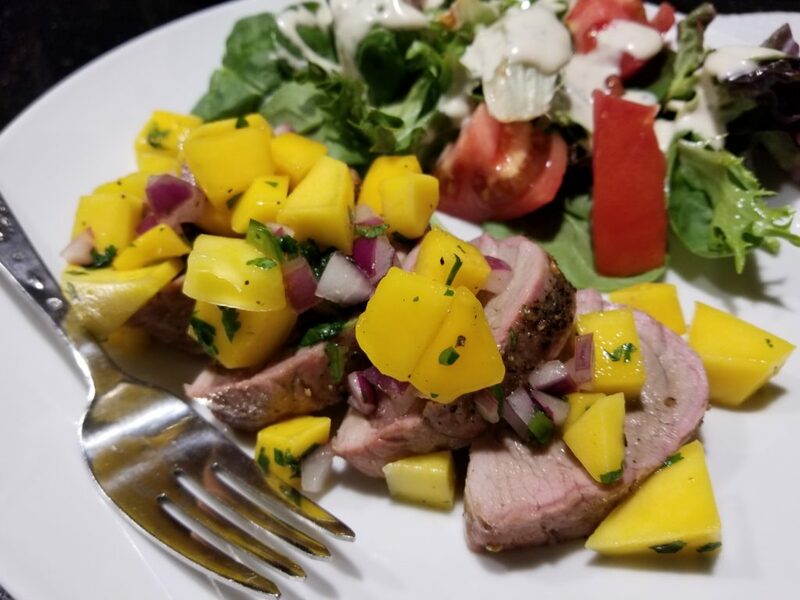 The salsa is also easy to whip up and makes a great topping for the pork! A little side salad with tomatoes from our garden and we are set. 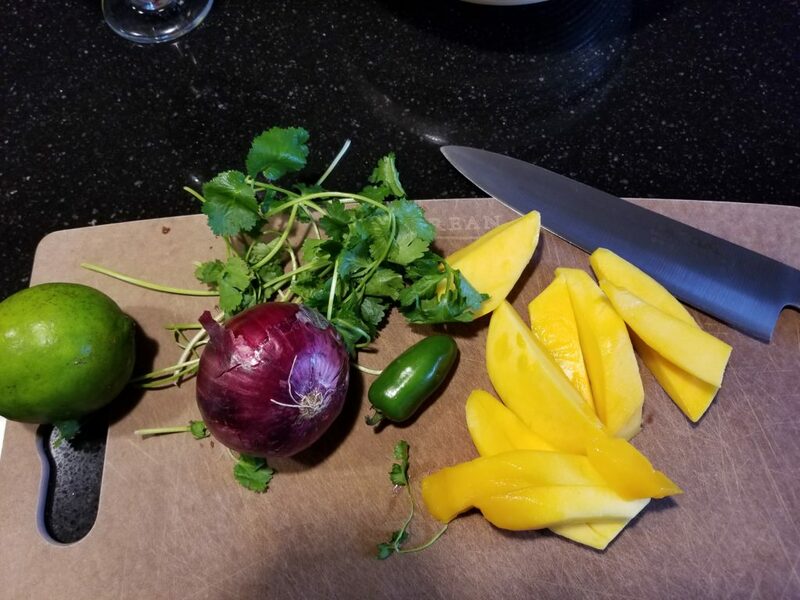 For the salsa you need – mango, red onion, jalapeno, lime and cilantro. Dice and mix in a bowl and you are done! Let cool in the fridge while you cook the pork. Toss ingredients in a bowl and mix up. Be sure to add some salt, to taste. The cilantro freshens this up and makes a perfect summer salsa. 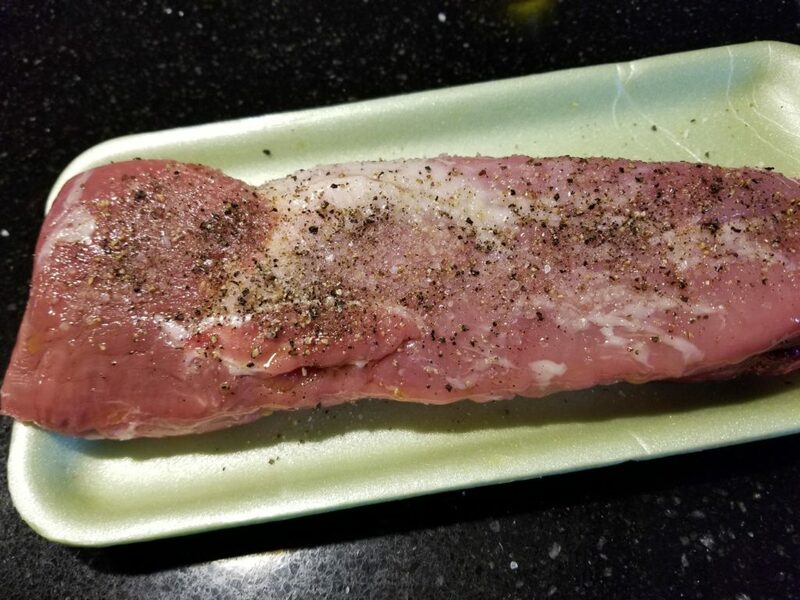 Get a nice pork tenderloin, season with olive oil, salt and pepper. 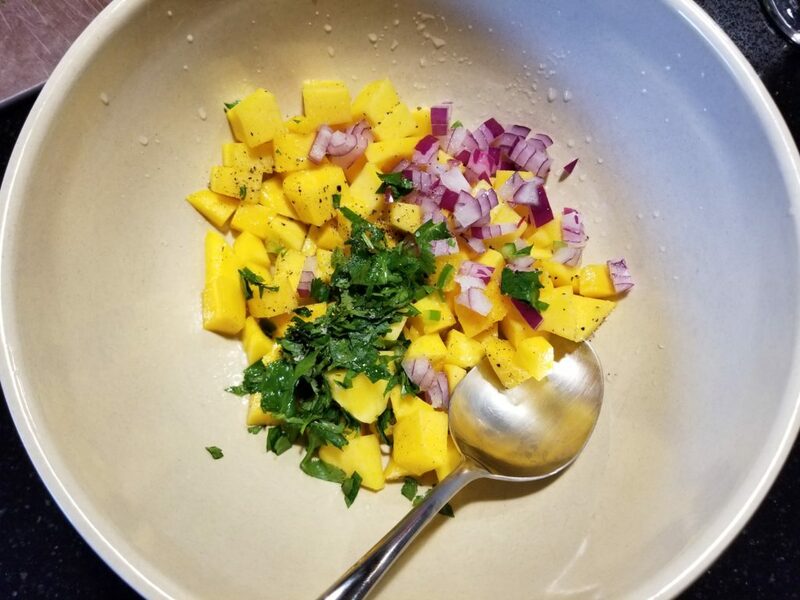 Keep it simple tonight as the mango salsa will add tons of flavor. Let it sit out for about 30 minutes before grilling. The pork is done when the internal temp reaches 145 degrees. Do not overcook this cut of pork. It will get tough and dry if you do! Serve it up with salad and the salsa and you have a great weeknight meal. Cheers! Mix everything in a bowl and chill in fridge for an hour or so. 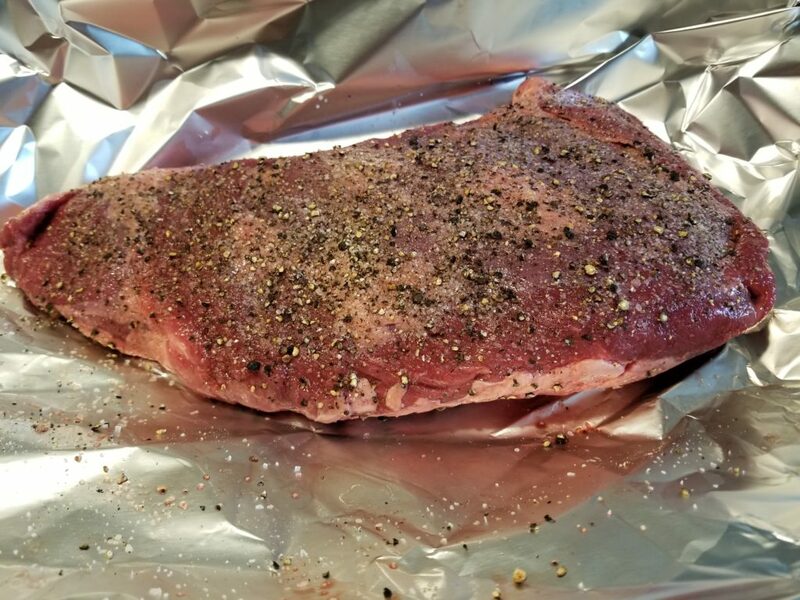 Tri Tip is one of my favorite cuts of meat. I heard about it from my sister who lives in California. This cut is popular there but not so much in the Midwest and it can be hard to find. But never fear p Trader Joes has an excellent tri tip!! Normally I will marinate this then just grill to a medium rare. Today I thought I would try to smoke it for a few hours and see what happens. Well it turned out awesome! 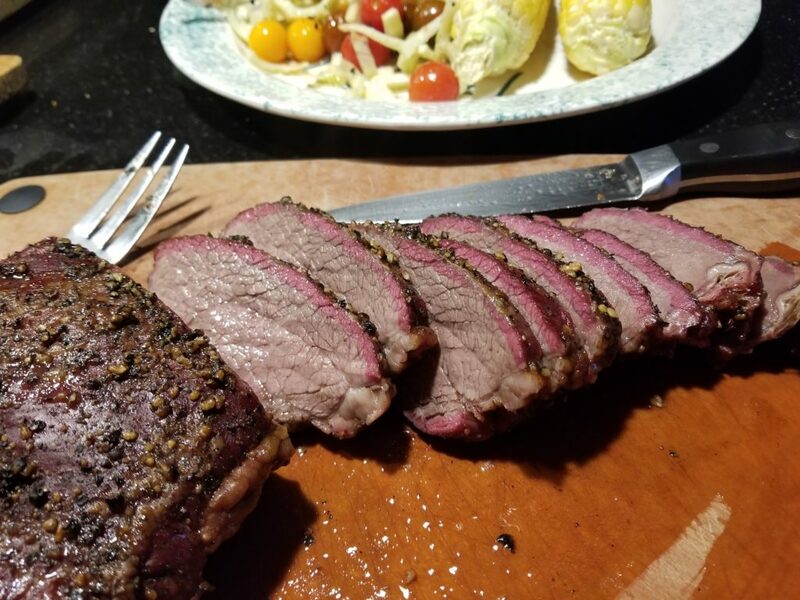 Similar to a brisket but much more flavor. For the seasoning I did olive oil, salt and pepper. I mixed up 1/8 cup of each and coated the tri tip. This created a great crust and flavor. 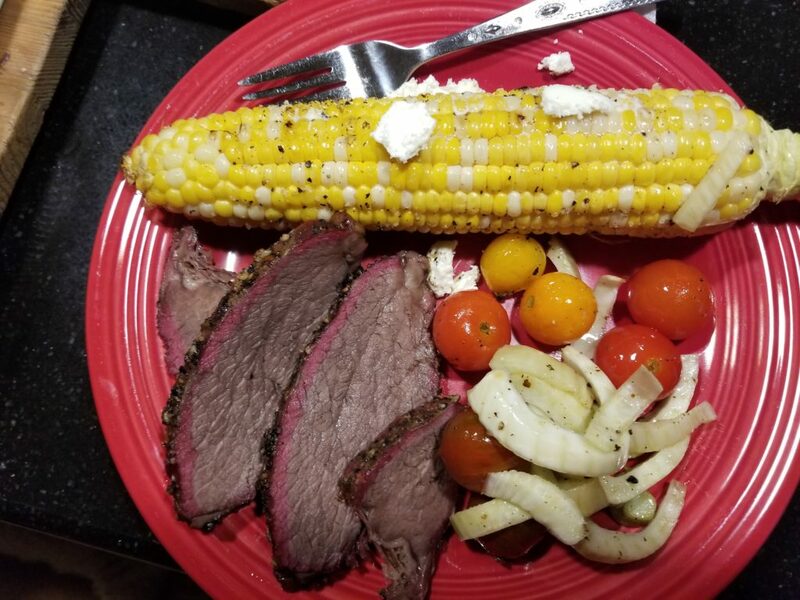 I set the Traeger on smoke and cooked for 4 hours. After the 4 hours pull the meat of the grill and wrap in foil, along with 1/2 cup of beer. Crank the grill up to 350 degrees. Add the meat back to the grill and cook 45 minutes. That is it – let it rest 15 minutes before slicing. Check out the smoke ring!! The smoke, salt and pepper gave this so much flavor! No need for any sauce with this one. 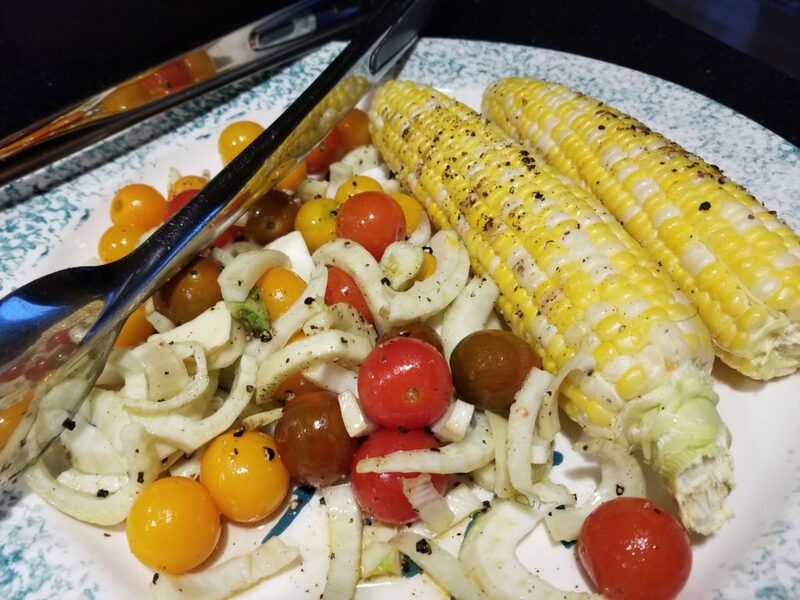 For the sides I added grilled sweet corn and a cherry tomato/fennel salad. We got the corn at the farmers market and the tomatoes came from our garden! Summer at it’s best. Cheers! Our friends (Rindy and Aaron) went in together for 1/2 a pig. We picked it up yesterday from Brothers Meat and Seafood, a local butcher in Maple Grove. Now that we have LOTS of pork it is time to try it out! Kris and I decided to try the chops. These were bone in and medium thickness. 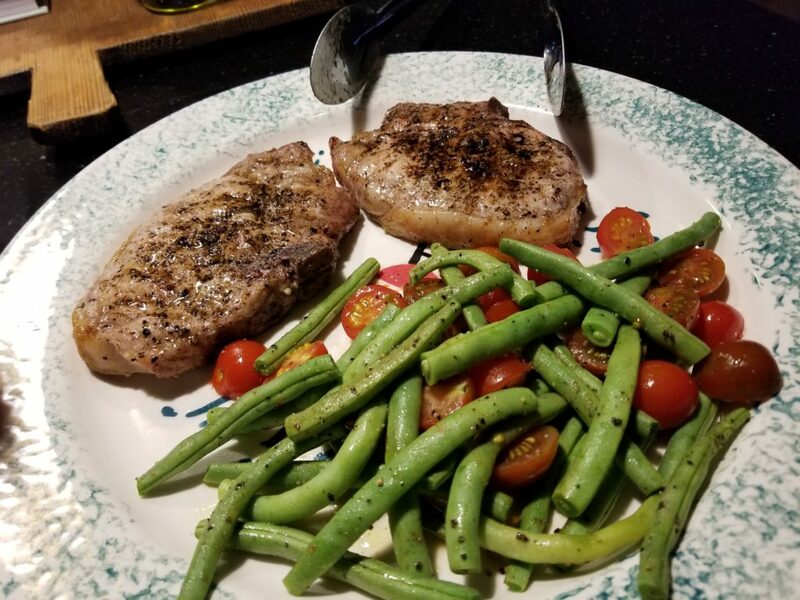 We like to keep it simple with chops so just olive oil, salt and pepper for the seasonings. I also made some apple chutney to top off the pork. 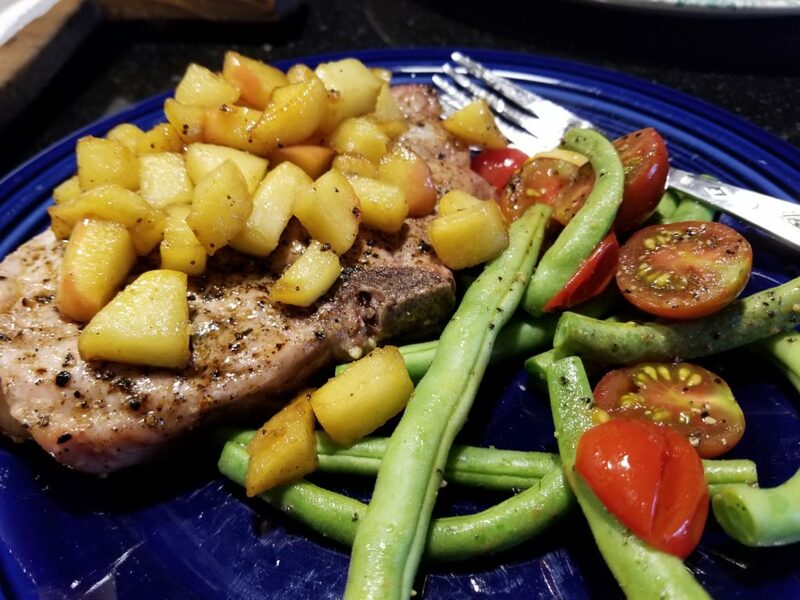 Apples and pork just pair so well together! Grilling time was only 20 minutes at 350 degrees for these bad boys. For the side dish I grilled green beans and cherry tomatoes. We got these from our garden! This is the second year Rindy, Aaron, Kris and I have had a garden and things are growing great. The garden is at R and A’s house so they do the work and we reap the benefits:) Thank you R and A!! The beans and tomatoes only take 10 minutes to grill so I added them to the Traeger once I flipped the chops. Easy and tasty summertime. Cheers!